On 11-1-11, Virden's Dr. Todd Austin (aka 'The Bat Doctor') entertained 280 Virden Elementary School students about BATS! Austin, a Doctor of Chiropractic, has been a bat conservationist and a member of Bat Conservation International for 21 yrs. Nov. 6, 2011 - PRLog -- Dr. Austin Entertains Virden Elementary School Students about BATS! On Tuesday November 1, 2011, Dr. Todd Austin had the opportunity to thoroughly entertain and educate 280 North Mac (Virden Elementary School) students about bats. Austin, a Virden Chiropractic Physician, has been an avid bat conservationist for exactly twenty one years as of this month! Austin, also known as ‘The Bat Doctor’, has been speaking about bats to audiences of all ages throughout IL for 15 years. Since that time, he has delivered over 80 presentations and has educated over 4,500 people about the world's only mammals that are blessed with the crowning glory of flight. Dr. Austin educated all of Virden's Kindergarten, 1st, 2nd & 4th graders on the day after Halloween 2011 with one of his many Powerpoint slide presentations, which was titled "Vampires, Fruit Bats & Insect-Eating Machines". Many of the slides are from Austin’s own personal work in bat conservation with bats over the past several years. * how Australia's "Bat Mum's" care for orphaned fruit bats pups. * and how a fungal disease called White Nose Syndrome is threatening our North American cave-dwelling insect-eating bats. ‘The Bat Doctor’ also showed slides to introduce the children to many of the newest bat friends that he’s made over the past few years, including both adult bats and pups. One of the kids favorite stories was about 'Trouble' the big brown bat, who Austin found hanging from a frightened person's shower curtain! Austin donated the book "Welcome to the World of Bats" to the school library. Virden’s ‘Bat Doctor’ also left some small bat items for each of the students and gave a recent back issue of Bat Conservation International's BATS magazine to each of Virden's elementary school teachers for use as an additional learning resource in the classroom. Photo caption: Virden, IL's Dr. Todd Austin (a.k.a. 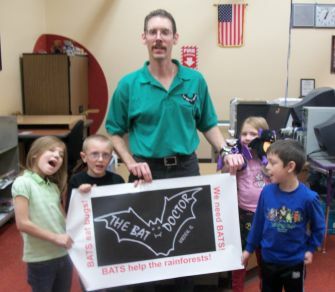 'The Bat Doctor') poses for a picture with some 1st grade students following one of his bat education and conservation presentations on November 1st, 2011. Dr. Todd Austin, also known as 'The Bat Doctor', is an avid bat conservationist, who has been studying bats and their behavior for over 2 decades. He's also been professionally speaking about bats since 1995, having educated over 4,500 people since that time. Austin has also been featured in BATS magazine, an international publication (by BCI) on three seperate occasions. I'm an avid bat conservationist, who has been studying bats and their behavior for 2 decades. I've also been professionally speaking about bats since 1995. I've been featured in BATS magazine, an international publication (by BCI) on three occasions.